Pallas Athene, known to the Romans as Minerva, is said to have sprung full-grown from the forehead of her father, Jupiter, king of the gods. Her importance is second only to that of Jupiter, as the virgin goddess of wisdom, warrriors, peaceful justice, the arts, and healing. She was a majestic woman, clad in armor, wearing a helmet, holding a spear in one hand and a shield in the other. The center of her breastplate was that of the Medusa, whose snakey hair and aggressive face were supposed to deflect evil. Its borders, edged with snakes, symbolize her wisdom and her gifts of prophecy. Pallas Athene was an invincible warrior, respected for her brilliant battle plans and her ablility to "think like a man". One of the many stories surrounding Pallas Athene relates to how she took her name. The tale involves her being in the midst of a combat practice with her foster Pallas, when she was distracted by Jupiter's image. As a result, she accidentally killed Pallas. In her grief, she took the name of Pallas in front of her own and used the image of Pallas as the template for the Medusa for her breastplate. Arts and crafts also come under the domain of Pallas Athene. She taught all manner of artistry, from cooking to metal working. And as goddess of health and healing, Pallas Athene taught humanity the miracles of medicine, particularly those that involve integrating mind and body. Astrologically, Pallas Athene functions as the feminine expression of qualities usually associated with men. Her position and aspects in your chart represents the condition of your attachment to your father and your desire and ability to emulate him. Do you submit passively in the face of strong masculine power? Or, do you carry the role of disciplinarian to the level of tyrant? Hopefully, it's somewhere in between. 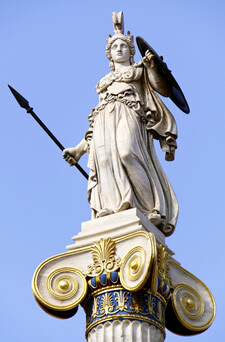 Pallas Athene shows how you combine courage and strength with wisdom and fairness. She shows how you handle thinking on a creative yet practical level. And most of all, she shows your ability to strategize, your ability to see the "big picture". She describes both the unconscious masculine side of a woman and the unconscious feminine side of a man. Women who display too much of these male characteristics are often rejected by men as being "too pushy". They may be torn between family and career, sacrificing one for the other. Men who overdo these traits may have difficulty showing vulnerability and tenderness. Or, they may have difficulty expressing their aggressive nature. And yet, Pallas Athene requires us to integrate and balance the traits of both genders into our psyches. She gives us the power to visualize wholeness and heal ourselves, both mentally and physically. Her position in your chart shows how you balance your need for bravado with your need for restraint and submission. Pallas was the second asteroid to be discovered, being first sighted on March 28, 1802 by Heinrich Wilhelm Matthäus Olbers, a German physician. Olbers came upon Pallas while attempting to determine the orbit of the asteroid Ceres, which had been discovered the previous year by Guiseppe Piazzi. Although Olbers was a physician, he spent his nights in the upper story of his home, observing the night sky. He was known to have developed the first useful method of calculating the orbits of comets. Pallas is the second largest of the asteroids and spends 4.62 years completing a journey around the Sun. It has a steep inclination to the ecliptic of nearly 35 degrees and an elongated elliptical orbit. Pallas spends a little less than two months in Cancer and Leo and close to three months in the other signs. 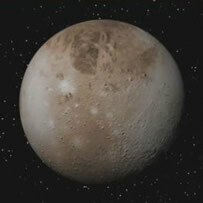 It turns retrograde every 14-17 months, for a period lasting 2.5 to 4 months.